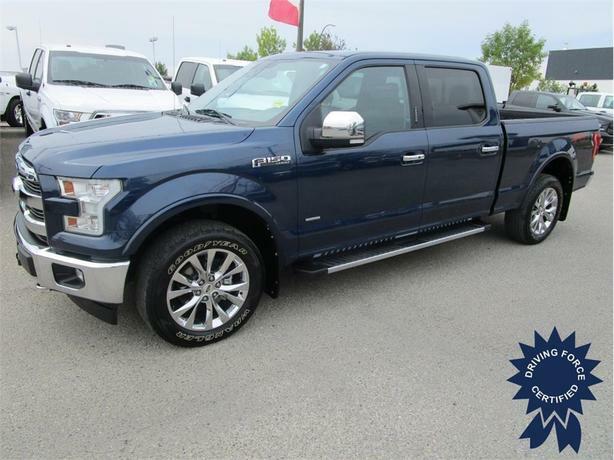 The gorgeous 2017 Blue Jeans Metallic 2017 Ford F150 Lariat SuperCrew FX4 Package comes well-equipped with a 3.5L EcoBoost V6 twin-turbo and 10 speed automatic, heated/ventilated black leather bucket seats, heated steering, 6.5-foot box with spray-in bed liner, 502A luxury package, navigation, twin-panel moonroof, remote start, backup camera w/zoom, 20 inch wheels, side steps, LED side-mirror spotlights, Lariat chrome appearance package, 3.55 axle ratio, integrated trailer brake controller and factory tow package, rear wheel well liners and much more. This unit also comes with a clean CarProof vehicle history report, 120 point certification, 2 sets of keys, and balance of factory Ford warranty. Call or email one of our helpful fleet sales consultants in Calgary today and experience the DRIVING FORCE difference.